I had another coast to coast road trip this past week and needed to prep some take along knitting. Currently I am knitting a sweater, the LARCH cardigan, and a shawl, BITTEROOT. I knew the shawl was not going to be the travel knitting, it is getting to the point of beading so did not see that happening on an airplane. The cardi however was the perfect choice. Sleeves are are great airplane travel knit. 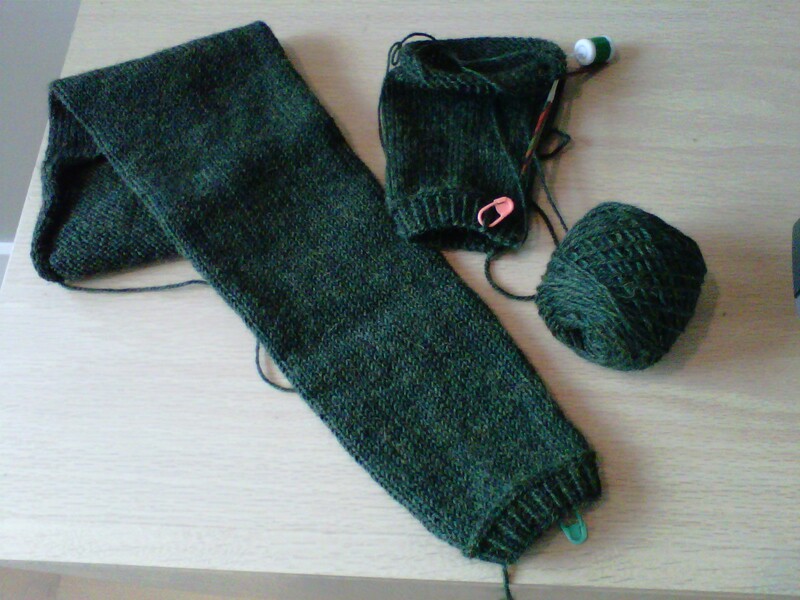 These sleeves required just a little bit of prep as they have this fabulous detail of twisted rib, bind of, pick up the bind off and then began the sleeve in the round. So I prepped both sleeves to the point of joining in the round. 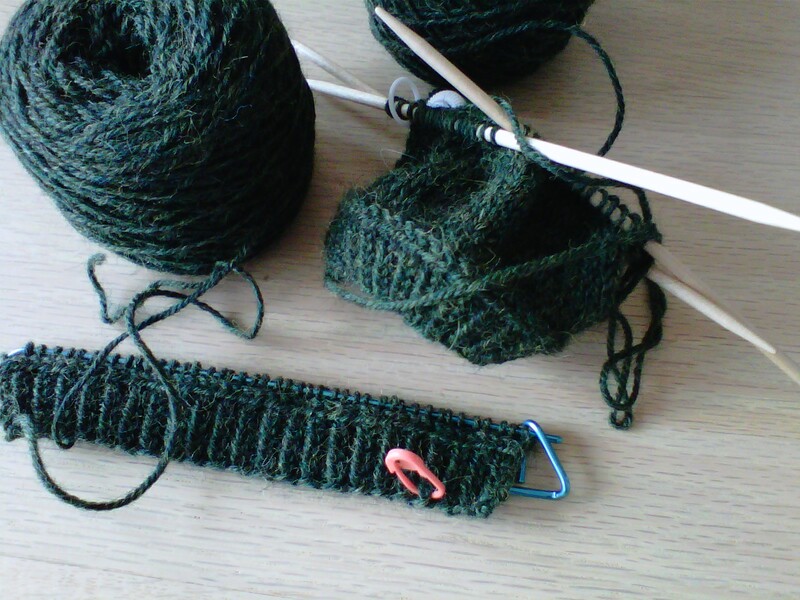 A little optimistic on what I was going to accomplish, but did not want to run out of knitting! Getting to the East Coast wasn’t too bad, planes on time, ahead of the ugly weather, but full flight, middle seat for 4 1/2 hours. UGH. The good news is that in a middle seat and 14″ circulars you can comfortable knit a sleeve, or at least part of a sleeve. Coming home was another story, the storms had hit. The good news, mine was one of the few flights to make it out. The bad news, middle seat again, OK I can deal with it. Oh, but wait, two screaming children in front of me. Not tired or sick screaming, but bitchy and demanding screaming for all 5 1/2 hours. Even my iPod could not block all of the racket out. Pity the guy next to me who did not have earphones. Survived the plane, but landed at the satellite terminal so took longer than normal to get to my pick up zone, bummer missed my ferry by two minutes. Plan B stop into the ferry terminal restaurant and have a glass of wine and a bite of dinner, not so bad. BAD, in comes two strollers, plus 3 under 6-year-old children and 3 mothers who were in another world. Again, screaming demanding children, spilling water, running around restaurant. But of course, that were on the same ferry boat as I got on. Fortunately the boat is big, even though the ferry crew yelled at the children that running was not allowed and they needed to sit down. Finally home after a 22 hour day, a glass of wine, and I am fine. Quiet at last! The sleeves, one complete, second 1/4 done. Check out the Larch cardigan on Ravelry. It is a really great pattern, very well written and can be knitted comfortably on planes, trains, ferryboats, and around screaming children. This entry was posted in Dragon Lady Tales by osethney. Bookmark the permalink.